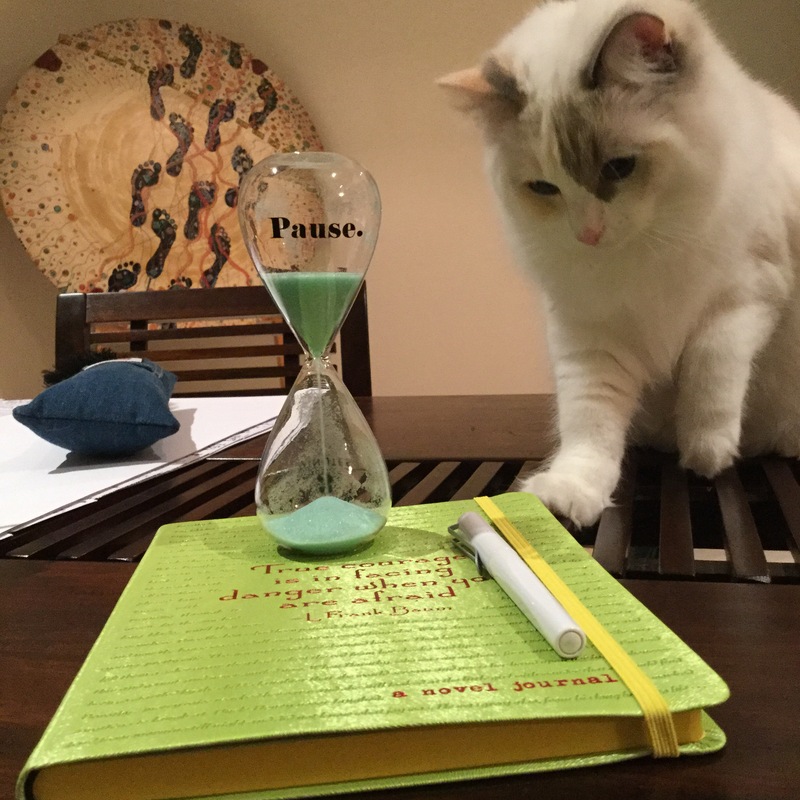 Tonight, on my way home from my day job, I fell into Kikki.K and purchased a gorgeous new writing pen and this fabulous ‘Pause’ 3 minute hourglass. 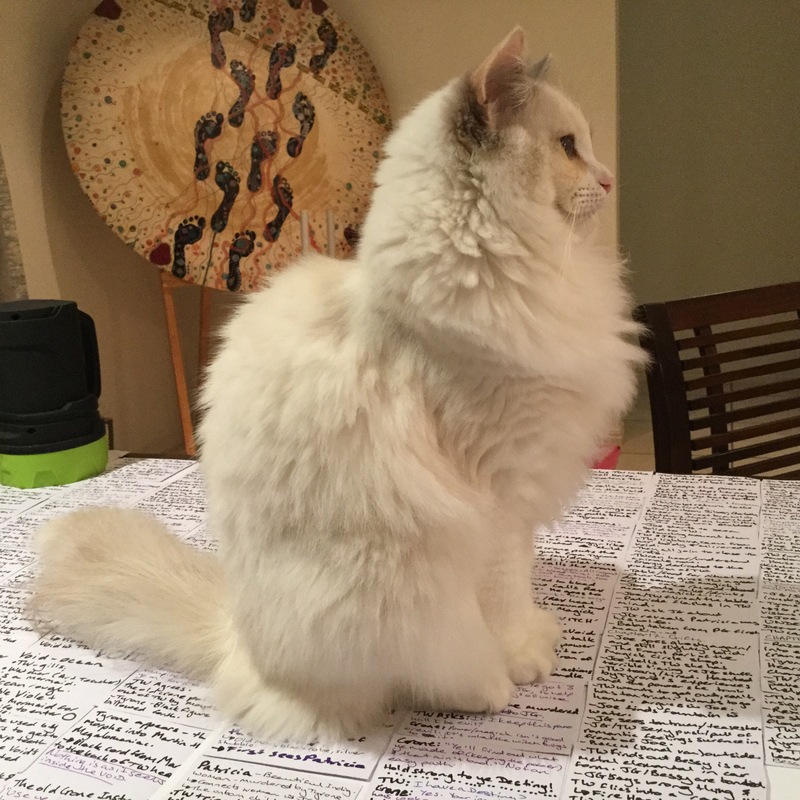 You can see them in the photo above with my new journal, and Miss Poppy, my sweet nine month old ragdoll kitten. She’s inspecting them all for quality purposes, I’m sure. Yes, she’s huge for nine months old. 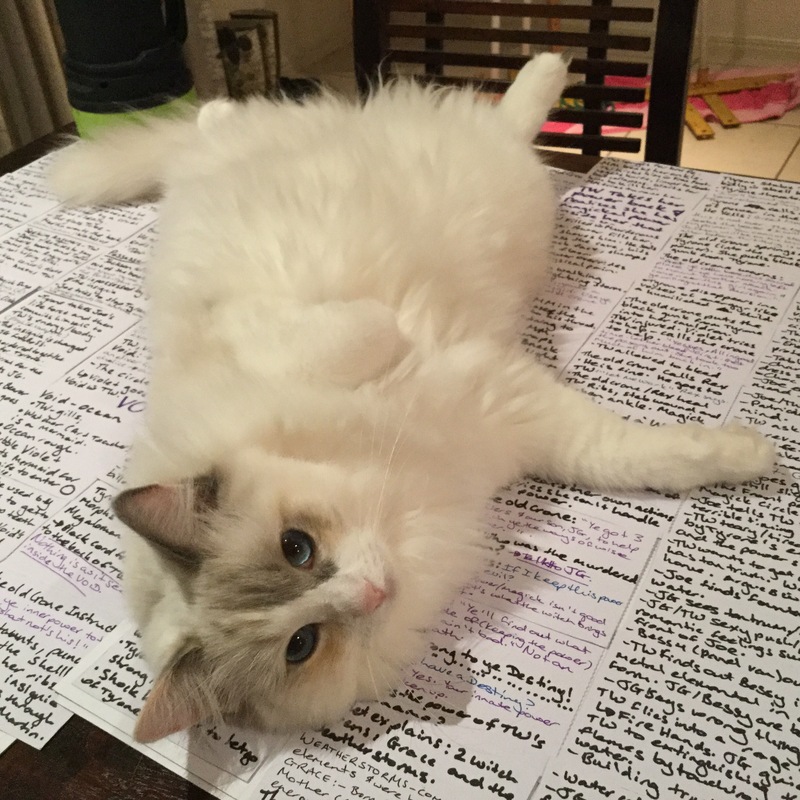 But that’s a ragdoll for you! Everything got a good sniffing and despite the mint sand running through the hourglass, her fascination fell to the pen. They’re fun to swipe at and she loves to see them scuttle across the table or floor after her paw has lashed out at them. Anyway, I felt inspired by the ‘Pause’ hourglass because it is a reminder that as a writer I need to take a breather from what I am doing in the day and become mindful of my own body and where I am in the world. 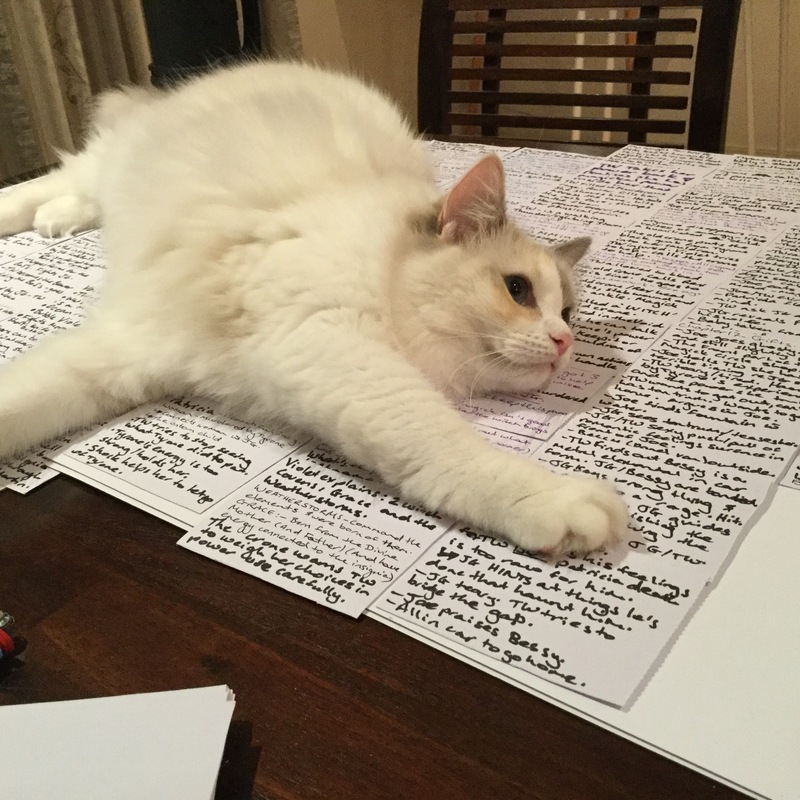 Especially when I have been in the thick of writing for sometime. I’ve noticed that I can become utterly brain fogged and there is nothing more grounding than taking time to breathe into my belly and feel my feet flat on the floor. Three minutes. That’s it. Just breathing. I’m starting this as a new practice in my writing. Personally, I suffer from anxiety that can flare up terribly, and at times that painful mental torture extends to my creative writing. That’s when I get stuck in my ‘monkey mind’ as my psychologist terms it. It’s an analogy she uses to explain the critical left brain and why it’s doing such crazy stuff, like trying to convince me that I’m not safe. I like to imagine I actually have a tiny weeny little monkey inside my head who tries to tell me stories that aren’t necessarily true but certainly feel true at the time. The monkey gets louder when my anxiety is playing up and the stories about all the awful things that are going to happen pound around inside my head like a brass band playing off key. People have told me to just focus on something else, but when that monkey is so loud and insistent, like a two year old demanding attention, it is nigh on impossible not to listen. I sound crazy don’t I! I’m not crazy, I’m just dealing with fears that nibble at the internal fabric of my existence. Threads are pulled out by my monkey mind and painful memories surface. Visceral emotions take hold of my nervous system and my adrenal glands go into hyperdrive. I’m on high altert even when there is no danger around. So I turn to my writing. I turn to my art. And I turn to my animal companions for the relief and care that I need. These things bring a calmness into my life, but not always. It’s a process. What writing, reflective writing does, however, is show me the patterns of thoughts travelling through my mind and the stories that my monkey mind has been spinning. It gives me an opportunity to question their validity and to gain control by defusing the power of the anxiety triggers deep inside. Taking time to breathe helps. It really truly helps. So, when I take a moment to just sit and breathe, I now watch the tiny grains of mint sand fall through the hourglass, and I focus on pressing my feet in to the floor. I focus on breathing down through my body and out through the souls of my feet as if the air is actually travelling through my body and passing into the earth itself. I focus on expanding my belly my lower ribcage on the inhale and contracting that same part of my belly on the exhale. I’ve been working on breathing deeply for about six months now. My psychologist has been a blessing. At first I really didn’t want to learn how to breathe. Oh no, none of that. No, I just wanted relief from the internal pain and grating fears that had rubbed my nerves raw. But she just smiled and taught me the technique. Bless her (now). And let me be the first to say that it may have been natural for me to breathe from my belly as a baby but as an adult who has been conditioned by all sorts of experiences, it is not easy to do. But the need for mental and emotional relief drove me to practice. Lying flat on the floor, one hand on my lower rib cage and the other on my heart. In I’d breathe, and my lower rib cage would expand. Out I’d breathe and my belly would contract. The hardest thing I had to learn about breathing like this was not to allow my chest to rise up as I filled my lungs with air. The hand on my heart sat there as a reminder: don’t breath shallow. So, when I saw this gorgeous little treasure in Kikki.K, meaning the ‘Pause’ hourglass, I knew it was coming home with me to remind me to take deep breaths during my day, during my writing and especially during stressful times. Watching the mint sand mesmerises me. The mint grains sparkle as they flow through the hourglass and pile up in the bottom half, and I find my shoulders relaxing just a little more the longer I gaze at its beauty. And three minutes really isn’t that long, believe me I’ve just found out. Watching the grains fall brings me back into the now. And the now is really all we have. This moment, right now is our precious time. It’s our life taking shape. This is the moment that we are making changes or staying the same. I love that about coming back to the now. 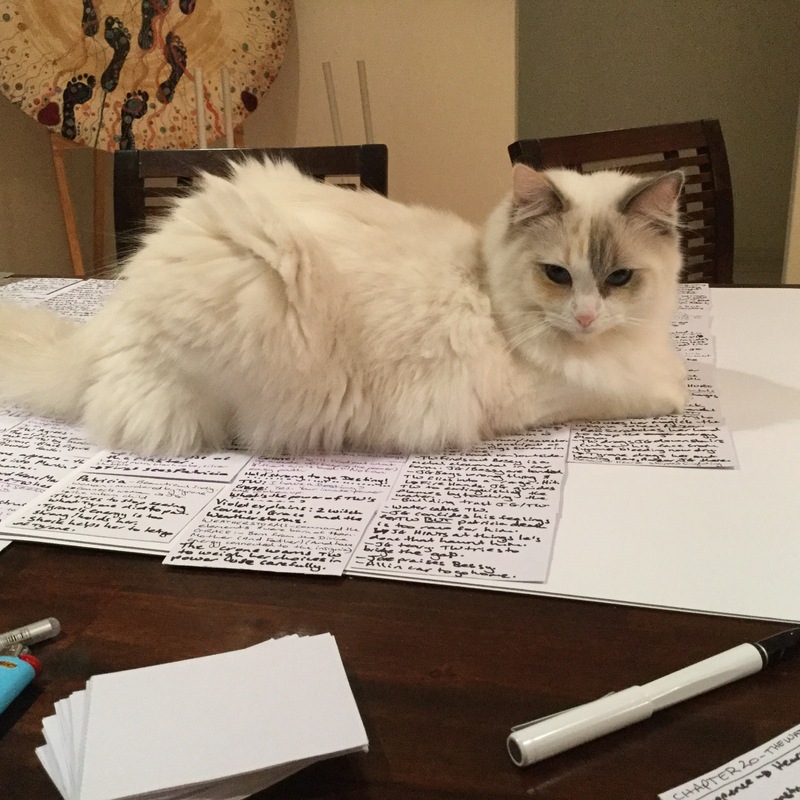 Then to have my beautiful ragdoll cat join me for a moment during my writing practice … well it’s hard to describe, except to acknowledge that my animal companions bring me peace and happiness and personal love beyond any words I can speak. Right now, I’m sitting cross legged at the table writing this blog post with Rocket, my black toy poodle curled up on top of me. He’s warm and snugglely on my legs. I can feel his heart beating and the calm trusting nature he has. That’s a blessing and one I am treasuring in this moment as the tiny mint grains fall through the hourglass. So, if you come across a ‘Pause’ hourglass and you’re a writer or someone who suffers from anxiety or even depression, maybe think about taking those three minutes to stop, gaze and breathe. Gaze at the sand falling through the hourglass and feel your feet on the ground. Expand your belly and breathe in and out. Now is a precious time to appreciate.